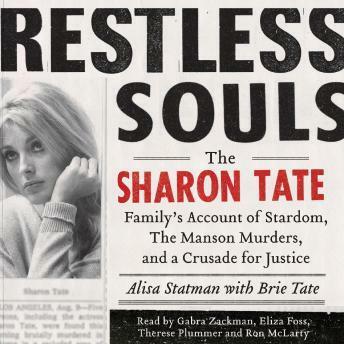 Listen to "Restless Souls: The Sharon Tate Family's Account of Stardom, Murder, and a Crusade" on your iOS and Android device. the dramatic role Sharon’s father, P. J., a retired army intelligence officer, played in finding his daughter’s murderers the reaction P. J. had when he came face to face—alone—with Sharon’s convicted killer in a holding room during a parole hearing the threats and menace that extended beyond prison walls, haunting the victim’s family for generations laterthe fight Sharon’s mother, Doris, mounted to insure the rights of victims’ loved ones, particularly the right to make an ‘impact statement’ at parole hearings—a legacy that has helped keep dangerous criminals behind barsthe battles Sharon’s sister, Patti, waged with the entertainment industry as she tirelessly worked to prevent artists from glorifying her sister’s killers in music, art, and filmsTold from the Tate’s extraordinary perspective Restless Souls offers a rare glimpse at the post-trauma survival of a family and their journey to find justice and ultimately, peace—a glimpse that couldn’t be more timely as Charles Manson comes up for parole again in 2012. An interesting peek into the aftermath of violence, murder and its effect on the families of the victims. Definitely recommended for true crime lovers. This gives an intimate look at the families saga. Some of the writing is poor but the story itself good so making it quite tolerable.